One colourful, modern and lively property at a time, the Generator group is transforming the experience of shared accommodation from one of dour, linoleum-lined barracks for impoverished Gap Year students to one that is smartly appointed, design-led and, dare we say it, desirable. 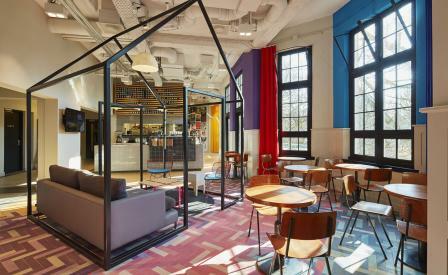 Billed as Europe’s fastest growing hostel brand with a penchant for on-trend destinations like Dublin, Berlin, Paris and Barcelona, the group has just opened in Amsterdam, the first salvo in a trinity of upmarket hostels to launch in 2016 ahead of Stockholm and Rome. The brand’s mix of pop-art colours and easy vibes – courtesy of long time collaborator DesignAgency – looms large in a brick pile built in 1908 that was once the University of Amsterdam’s science department. Rather cleverly, the design retains the academic flourishes in both the former lecture hall and library. The former is now called the Nescio – Auditorium Bar, the terraced seats of the lecture amphitheatre now repurposed as gathering spots, and the lecturer’s podium, a bar lined with lab beakers. The Library – another lounge – is another palimpsest, the past remembered in shelves of bright orange books. Meanwhile, the cheerfully compact rooms – ranging from shared bunks to private rooms, some of which can sleep up to four – are dressed in bright wallpaper that are almost Murakami in their abstract shapes and colour.